Just downloaded or received a PDF document file via email in a different language. Looking for quick and free ways to translate language of that PDF file online without need to download or install any software program. Check out following online tools and services for easy language translation of PDF files on the go. Translation service from Google at translate.google.com is an easy and efficient way for language translation. It allows you to translate language of any online website, copy – paste text and even uploaded documents. 1. 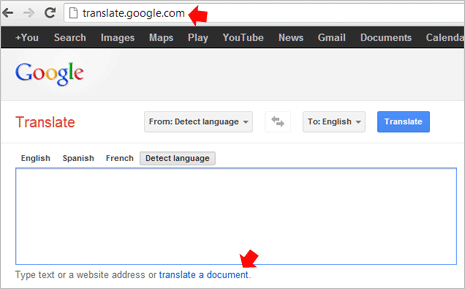 Open translate.google.com website and then click ‘translate a document’ link. This will show you option to upload file from your computer for language translation. 2. Click on Choose File button, select PDF file stored on your computer and click Open button. Now select language to which PDF file should be translated to and finally click on Translate button (big blue button at top) to start language translation. 3. A new browser tab or window will open showing translation progress in percentage at bottom left. The new window will display translated copy of the uploaded PDF document file. This service is ideal for translating small PDF files, it may not work with large sized PDF files containing lot of pages. Also, translation process for big PDF files may take little longer to complete. 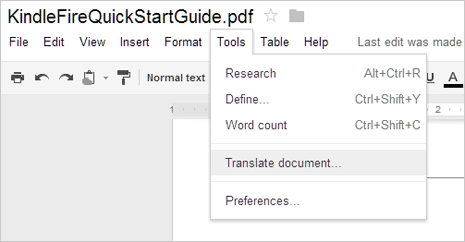 You can also use Google Docs service which is now part of Google Drive for language translation of PDF documents. Besides ability to translate language, the original uploaded PDF file stays in your Google Drive storage for future reference (though you may choose to delete it). 1. 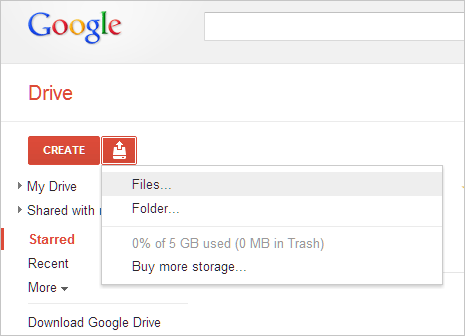 Open drive.google.com and then login using your existing Google or Gmail account details. Once logged in, click on Upload button next to “Create” button at top left and then click on Files option. 2. Select PDF file stored on your computer and click Open button. Then in the upload pop-up box, make sure you check two options: [Convert documents, presentations, spreadsheets, and drawings to the corresponding Google Docs format] and [Convert text from PDF and image files to Google documents]. 3. Then click Start Upload button, your PDF file will be listed automatically once upload is complete. Now click on the uploaded PDF file to open it automatically in Google Docs (editor) viewer window. 4. Goto Tools > Translate document option, then select the language for translation and click Translate button to start language translation. You should see translated document once the translation process is complete. Also the translated copy of PDF is saved in your account for future reference. 1 . 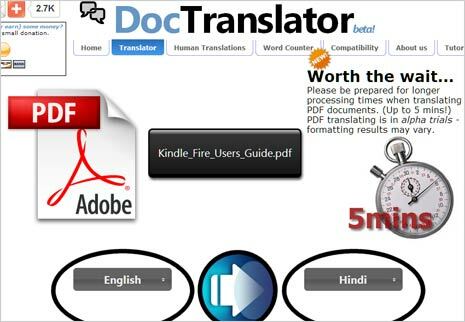 Doc Translator is another online service for translating PDF document files. It uses Google Translate service for actual language translation. Open Online Doc Translator website and click on Translate tab at the top. Then you will get prompt to allow download of applet file for this service to run in the web browser, click Run to continue. 2. Now click on the PDF option and select PDF file from you computer. Select the language for translation and it should start generating the PDF file with translated text. This service is little slow, using Google Translate and Google Drive (as explained above) are recommended options.